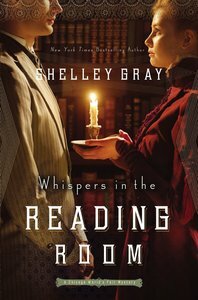 Lydia's job at the library is her world-until a mysterious patron catches her eye ... and perhaps her heart. About "Whispers in the Reading Room (#03 in The Chicago World's Fair Mystery Series)"
Customer Reviews For "Whispers in the Reading Room (#03 in The Chicago World's Fair Mystery Series)"
The story incorporates the developing relationship between Lydia and Sebastian, the understated relationship between Mr Vincent Hunt (Sebastian's man of business) and Bridget O'Connell (his servant), and a thread of suspense which comes to the forefront in the second half of the book. The characters were excellent, as was the plot and the way each of the characters were introduced and linked. There was also some excellent writing, and a low-key but evident Christian message. But the focus of the novel was on the bittersweet relationship between Lydia and Sebastian, and that was its' real strength. This could have been an almost-perfect read except for two things. There were some weird lines (e.g. the overused "he bit out" speech tag), and the ending came too fast-by which I mean the pace picked up and all the outstanding plot points were fixed in a couple of short chapters, which was out of kilter with the rest of the novel (which wasn't slow, but wasn't a fast-paced thriller either). These might be minor glitches but they were glitches all the same, and did affect my enjoyment of what was otherwise an excellent historical romance. Thanks to Zondervan and NetGalley for providing a free ebook for review.